Ippodo staff warped the box using bubble wrap sheet for the protection. Take bubble wrap away. 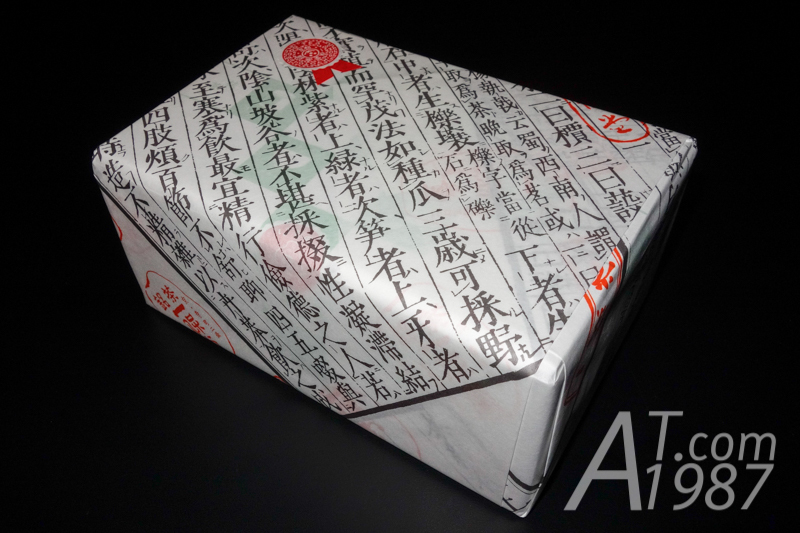 You will see a Ippodo paper wrap before the box. 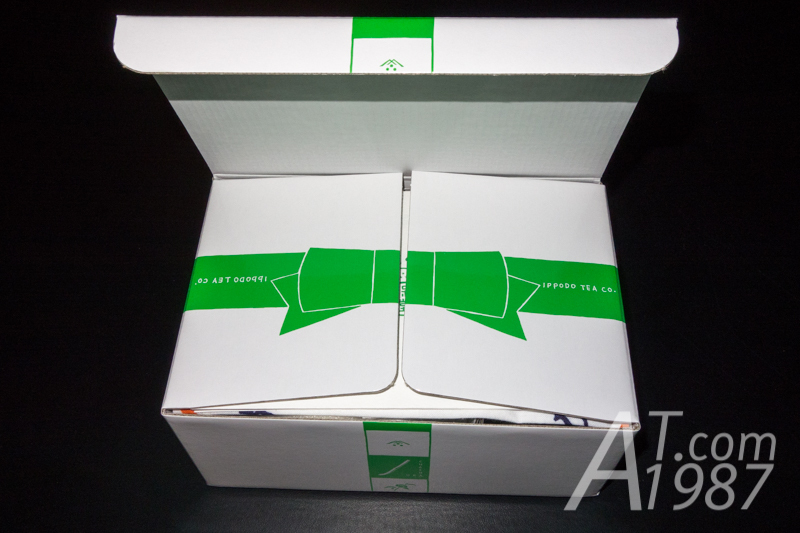 When you open the box, you will see a big green ribbon on the inner lids. Showing an Ippodo intent of this kit as a present. Inside the box you will see instruction leaflet and tea cloth (fukin) first. 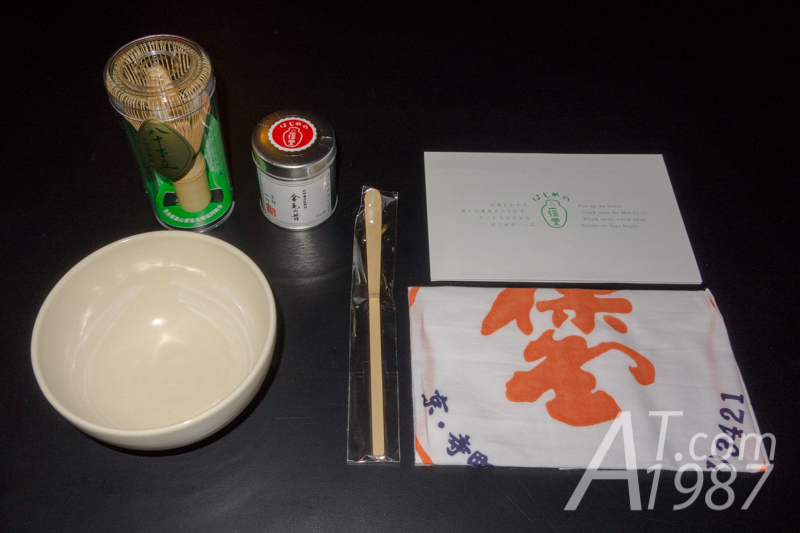 Other items in the box are 80 tips bamboo whisk (chasen), tea bowl (chawan), bamboo tea ladle (chashaku) and 20 grams of Kimmo-no-mukashi matcha. 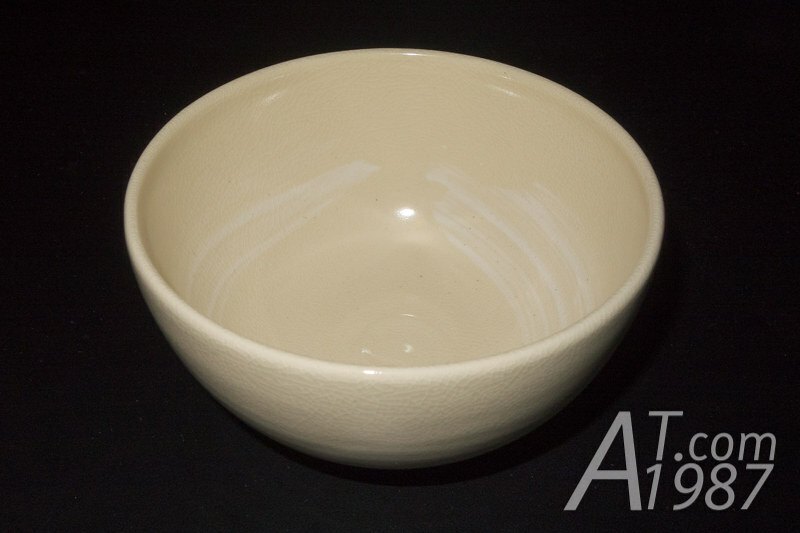 Tea bowl is glazed porcelain with the simple pattern. The glaze has the crackle inside. However its bottom isn’t glazed to making it slips from the fingers harder. The bundled Kimmo-no-mukashi has a balanced flavor according to Ippodo. Not too light or too rich. 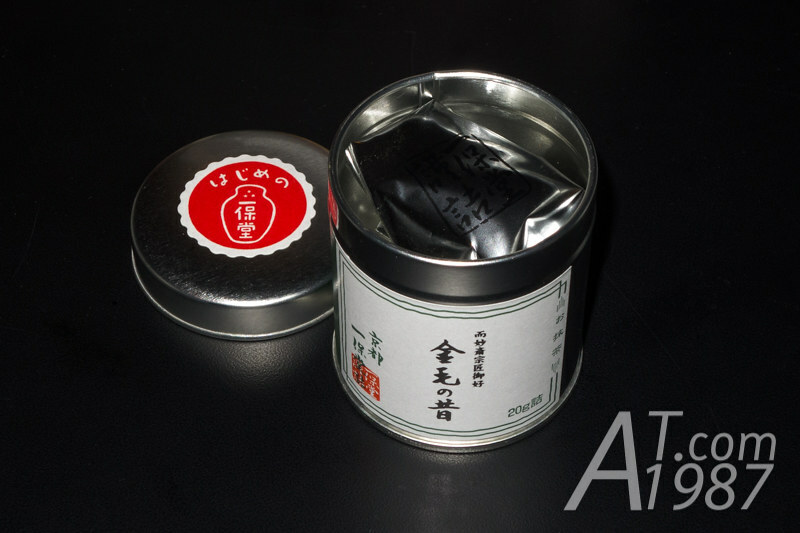 It is recommended for making thin tea (usucha). 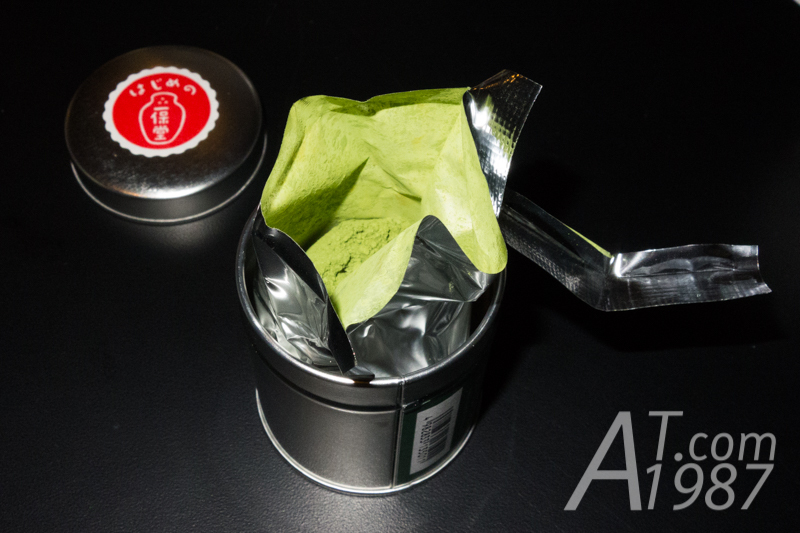 The tea powder is in the foiled bag to keep its freshness. The powder is different from the instant ones from ITO EN or AGF. It is more agglomerate but has more freshness too. Because of its freshness it can’t be kept for a long time. Only 3 months for unpacked bag. If you cannot finish the bag in one time, you have to keep it in the cold place and not expose it to the air. 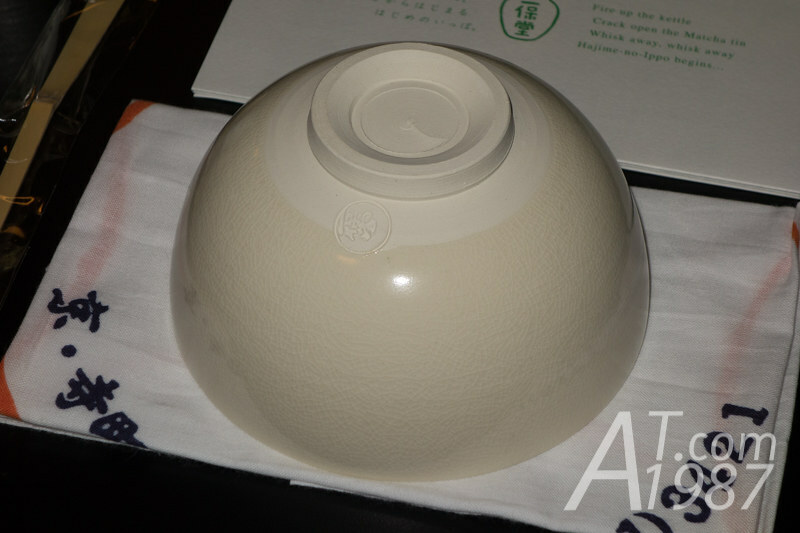 The instruction leaflet shows the method to prepare thin tea by using 2 grams of tea (about 1.5 ladles) and 1/3 bowl of 80°C water. Then mix them together with a whisk by moving hand in M shape. 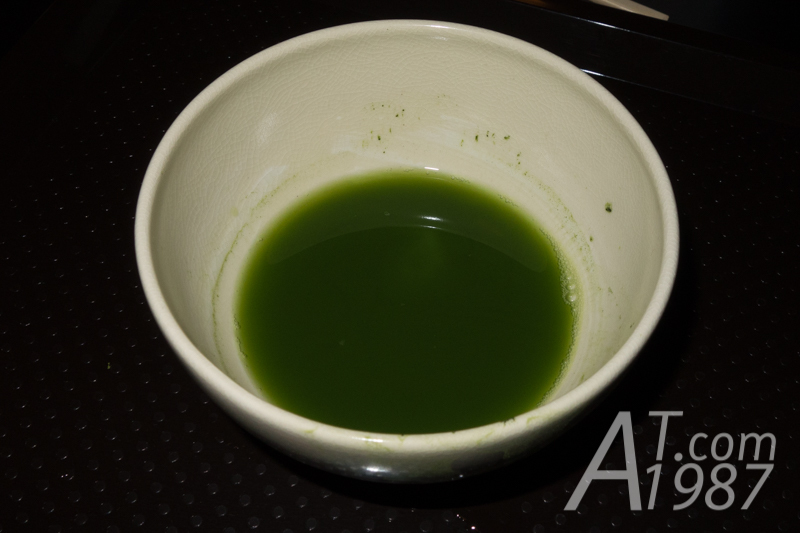 Finally you got a bowl of matcha tea. Since the powder doesn’t dissolve in the water. If you wait to long to drink it, the powder will begin to sink to the bottom of the bowl. Although the instruction is looked easy, it is very hard to make a proper tea especially whisking the tea. Do it lightly, the powder will not mix with the water. Do it hardly, the tea will spill. It took a long time for me to mix them. So the water is cooler. 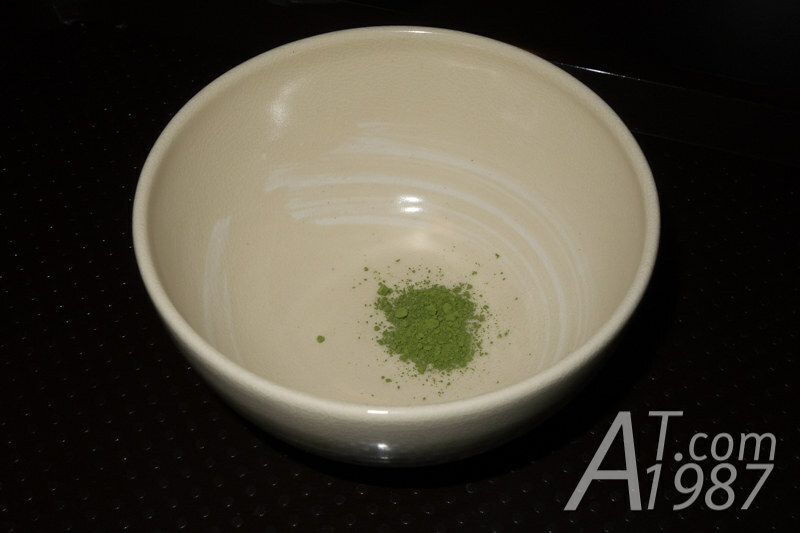 After I did 4 bowls, I just use put it in the coffee cup and make it like an instant matcha. Its taste is better than an instant one, the taste and smell is more rich. I think the taste will be better if I can prepare it properly. 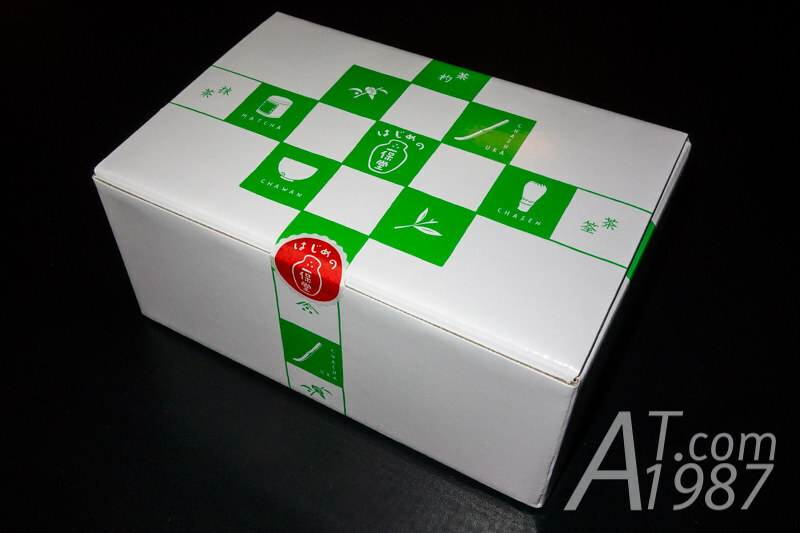 For those who interested in this matcha kit, you can buy it from Ippodo stores in Kyoto and Tokyo or order it from its online store. Also don’t forget to buy the tea strainer, which help breaking agglomerated powder. So mixing it in water will be easier.